Since getting back into the comic-book/superhero scene, one of my most pleasant surprises has been the New 52 Batgirl series. Whereas most of the New 52 material has been nothing great to write home about (e.g., Supergirl since issue 8), and some has been downright awful (Action Comics, Superman), Batgirl has been absolutely superb since day 1, due primarily to Gail Simone's top-notch writing. Because of how well this series has been both written and drawn, the Batgirl character has risen rapidly to become one of my favorite superheroes in all of comics. In fact, although as a general rule I would say that Supergirl is my all-time favorite, I have to admit that, just comparing New 52 incarnations, Batgirl has it all over Supergirl up to this point. 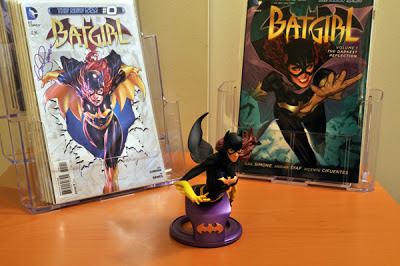 Given my growing esteem for this character, and my plans to create a small display dedicated to her (admittedly much less extensive than what I will be able to do for Supergirl), I thought it was high time to add a Batgirl statue to my collection. There are a few choices here, but only one that captures the New 52 version of her suit -- the Batgirl Bust put out by the +DC Comics line of collectibles. And I have to say this for +DC Comics -- their New 52 stories may only be mediocre, but the new line of busts they are putting out for the New 52 characters is absolutely first rate. Now if only the comics could be this good. The statue I picked up at the comic shop was the "display" model. For some people, who never take the item out of the packaging, I suppose this would be unacceptable. But since the thing had been sitting in a glass case for several months, untouched, and was in mint condition, I saw no reason to turn up my nose at the floor model. The guys at the shop always keep the boxes, so they were able to give me the box and styrofoam packaging to go with it. I don't have any way to make a real display with this statue yet (first I need to buy a house, then I need to buy or build some kind of display stand or curio for my collectibles), but I pulled out some of Batgirl's biographical literature (including my signed copy of Batgirl #0) to provide an admittedly rudimentary display background for photographing. The statue stands about 6" tall, the same height as all the other busts, and is not really a bust so much as the upper half of Batgirl's body from just below the waist to the tips of her bat-ears. This is a really well-posted statue. Batgirl is clearly in the middle of fighting some villain like the Joker or Riddler. She has her left hand cocked back, holding a bat-a-rang, ready to throw, with her right hand thrust out forward for counter-balance. She looks to the right, clearly planning to throw toward the right, across her body, with the 'rang, and the flow of her movement has caused her cape and hair to fly to the left. This really is a wonderful action pose for this character, and her facial expression is wonderful -- determined, but with a slight hint of a smile. You can almost imagine that, as she pulled out that bat-a-rang, she made a classic Batgirl wise-crack to the villains. The statue is made of porcelain, and is beautifully sculpted and painted. The colors are outstanding, with a shiny black for the armor and a golden-yellow for the boots, belt, and bat symbol. 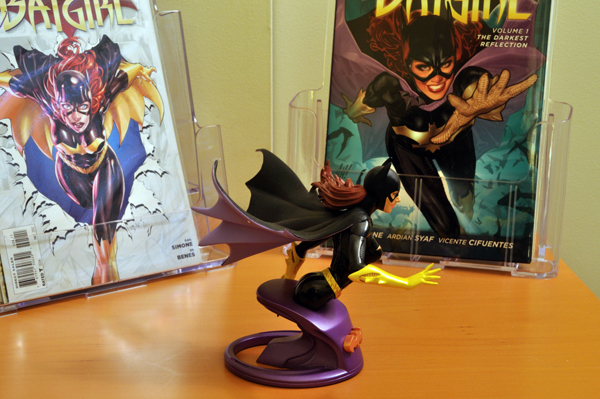 Her hair is reddish-brown, and the purple underside of the cape makes a nice contrast with all the black and gold. She really looks like a superhero. The base is a dark purple, matching the inside of her cape, and there is a very nice raised gold bat-symbol on the front of the base. Strangely enough, like the Supergirl statue, the symbol on the base is the old, classic (pre-New-52) version of the symbol, not the current symbol for either character. I'm not sure why they did that, but it doesn't do anything to detract from the beauty of the piece. As with the New 52 Supergirl bust, which I reviewed back in January, the Batgirl bust is a very high quality, well-crafted collectible. 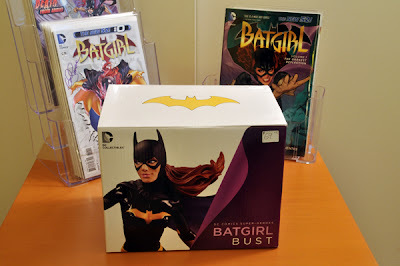 It retails for around $67, as most of the busts in this line do, and is well worth the price if you are in the market for a Batgirl statue. 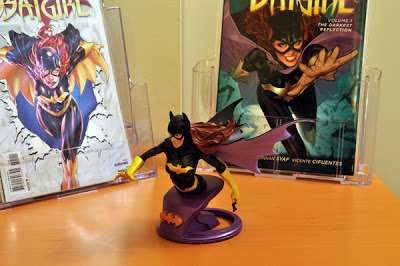 They had two other statues of this character in the comic shop, with the classic/previous costumes, and although they were nice, I felt this was the most attractive Batgirl statue I have seen. I give this one 10/10.